The mythology of ancient Greece gave the people their history, moral principles, laws, and their spiritual support. All aspects of human nature and experience had accompanying gods and goddesses that could be consulted or learned from. Deities could be implored for support and guidance in times of stress. If you suspected a lover of infidelity, you could consult Hera for help. If you needed strength in a task, Athena might assure you of victory. Perhaps Eros would tell of a passionate, new relationship, or you might seek the supremacy and confidence of Zeus. This thinking shaped a millennium of spiritual understanding and sacred thought. 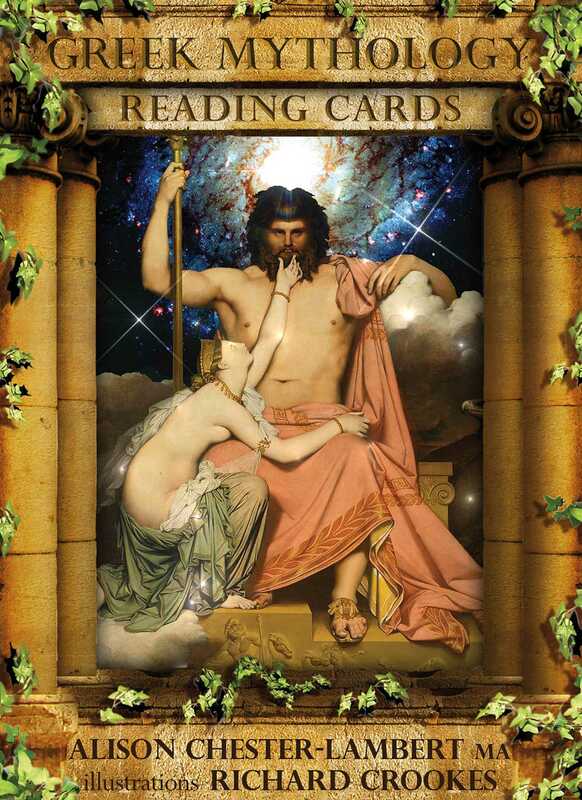 Now, with the Greek Mythology Reading Cards, you can easily consult the Greek pantheon and receive their guidance and wisdom. Pairing authoritative messages from Greek philosophy and mythology with classic and inspiring god and goddess imagery, beautifully enhanced by artist Richard Crookes, astrologer and Greek mythology scholar Alison Chester-Lambert offers an oracle to bring the Greek deities back into your consciousness, and ultimately the Collective Consciousness, as part of your soul’s awakening and growth. You can consult the oracle for decision-making, spiritual support, guidance, or life advice. The enlightenment and power infused in these cards flows upward from ancient times through the centuries into our new dawn, still as valuable now as it was then. The author explains how the gods and goddesses of the Greeks are still embedded in our world; we just stopped recognizing them. She reveals how using these cards brings them into consciousness again, for their sacred influence could be as powerful today as it was then. They are waiting in the wings to help us. We simply have to ask. These three goddesses were said to spin the future with a silvery thread and this powerful card describes the mechanism of fate. But actually, some ancient Greeks wrote that this is not always pre-determined and can be quite flexible. We are allowed to exercise some influence over our future as long as we work within the rules. To do this we should seek out our potential future by divination and then work to change the prediction if we don't like it. We can appeal to Zeus for his leniency, but also we should have confidence in our free will and ability to `bend` the energy and achieve a better outcome. This combination of both honouring the spiritual hierarchy and also understanding we have power and independence is an important one. Total belief in a positive future will bring contentment towards you. As you value each moment and get the best you can out of it, your confidence and your fortune will grow accordingly. Artemis is part of Light itself, but most especially the aspect of the Sun's light that sparkles and glints on water. She was swift footed and fast. In myth, we are told she is found in mountainous regions where the rain water tumbles in streams and waterfalls, reflecting and rejuvenating her light rays best. As Apollo’s twin sister, she accompanied him to fight the serpent which represents the night. Her silver bow is the crescent Moon which reflects Sun light. Artemis was determinedly independent, ravishingly beautiful and yet disdainful and enraged by the attentions of suitors. Imagine strong, swift and mighty Sun light hitting your eyes to understand her best? She was unforgiving of boastfulness and demanding of reverence. Artemis was one of the most powerful deities on Olympus and she surrounds you now with powerful Light, generosity, benevolence and prosperity which you should receive with humility and reverence. Athena excelled as a defensive warrior in battle, but also protected the peaceful arts such as weaving and sculpting too. She has an intelligent, smart superiority which assures success in all things. Whoever this card represents is now imbued with shrewd and clever strategising abilities. Maybe you are even due some academic or educational success, if that is possible. Athena was born from Zeus's head after he swallowed her mother Metis (Wisdom) in an attempt to maintain his supremacy. But Athena leapt out fully armed and brandishing a sharp javelin, proving that no-one could keep her and Feminine intelligence down. She remained chaste, preferring to be single and independent. Mythology shows that the goddess was indulged by Zeus and did just as she pleased. You should enjoy a time of clever success and superiority. If there is a battle to be fought, you will win it. Athena is by your side and truly favours the brave. Hephaestus was not handsome or beautiful like so many of the God/desses of Olympus. In fact he was ridiculed for his physical imperfections. But he reminds us of the value of workmanship, ingenuity and perseverance. His mother discarded him for his ugliness, but such was his cunning that he then trapped her in a golden throne he had cleverly forged. Only after he had been given Aphrodite's hand in marriage did he release his mother and this won him respect on Olympus. As a blacksmith Hephaestus had legendary skills. All the important equipment on Olympus and in myth, including intricate metal work, weapons and magical tools were fashioned by him. Zeus himself depended on him for his thunderbolts and sceptre. Hephaestus had strength, talent and craftsmanship. Such potential lies before you now and there may be an opportunity to create something special with hard work, perseverance and skills you didn't know you had. The Ancient Greeks revered Hermes for his support on journeys. He was the god of travellers whose image could be found at cross roads where he could bless the journey and safeguard the commercial traveller. You can see his statue on this card. He protected humankind and facilitated transactions and exchanges of all kinds, including those into and out of the Underworld. Hermes also carried messages from Zeus and was known for his persuasive words and willingness to help. Where there is movement or a need to connect, Hermes will facilitate and he wears winged sandals to speed things up. You may be about to take a journey, which Hermes will help you on. It could be a mental exploration or a physical one. We can learn by travelling, or learn by inquiring and seeking information. Hermes will facilitate any of these things. Perhaps even Zeus himself is sending you a message which you can receive if you look out for signs. Psyche was a beautiful mortal woman who was lonely until the god Eros fell in love with her. They were happy enough, but Psyche couldn't help herself and wanted more from him. She then naively betrayed his trust, putting Eros in grave danger. Eros left and Psyche was wracked with remorse and grief for many months, causing suffering to the mortal world. But even in her morose state, she was still sometimes foolish or lapse in doing all that she could to restore their relationship. However Eros recovered and the lovers were finally brought together for eternity by his devotion. We can be foolish in questioning love and make it difficult for a relationship. But fortunately the hot flames of Eros's passion can ignite a reunion, for ultimately the soul needs the life-giving passion of love which animates and awakens all things. Should you now just trust this and not question the situation? Alison Chester-Lambert, MA, studied Greek literature and mythology at the University of Wales where she graduated with a master’s degree with distinction in cultural astronomy and astrology. As an astrologer, she is a regular contributor to the UK’s Daily Mail Online, has written columns for many leading astrology and spiritual magazines, and has BBC and American TV credits including The Daily Politics Show on BBC2. She lives in Tamworth, England. Richard Crookes has more than 30 years’ experience as a freelance artist, illustrator, and calligrapher. He has worked on many card decks, including the award-winning Angels of Atlantis Oracle Cards, The Angel and Gemstone Guardians Cards and, with Alison Chester-Lambert, MA Astrology Reading Cards. He lives in Bangkok, Thailand. "Timeless images from artists of the past help bring the wisdom of ancient Greece forward for modern seekers in these 50 richly-designed cards."